Belwood Lake is a large reservoir on the Grand River. The river was impounded by the construction of the Shand Dam in 1942 for flood control and power generation. The main access point to the lake and dam is the Belwood Lake Conservation Area, which is operated by the Grand River Conservation Authority. The main fish species present in Belwood Lake include, northern pike, smallmouth bass, yellow perch, sunfish, bullhead catfish and carp. Recently both black crappie and walleye have also been reported catches in the lake. Most anglers visit Belwood Lake for carp fishing which are very abundant in the lake. 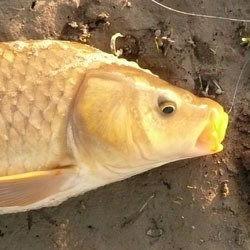 Angling for carp, usually involves still fishing on bottom or with a float, using corn or doe balls. Many carp anglers create their own recipe concoctions when making doe balls and some recipes are highly prized and secretive. Chumming an area prior to fishing is also popular amount carp fisherman. The average Lake Belwood carp is 5-6 lbs, although fish in excess of 15 lbs are quite common. 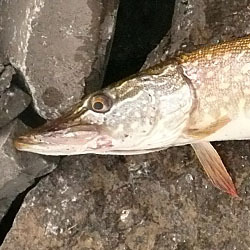 Pike and perch are also highly prized fish in Lake Belwood and are targeted both in summer and in winter. Ice fishing is quite popular on Lake Belwood, with anglers usually targeting weed edges, flats and the deep river bed of the now flooded basin. The most common techniques for ice fishing include, still fishing with live minnows, on tip-ups or jigging with spoons. Flashy or rattling spoons and lures have been known to be successful, due to the murky waters of Lake Belwood. Predatory fish will hone in on the vibrations created by these lures, imitating a wounded baitfish. During the spring and summer, many anglers target the smallmouth bass that inhabit the lake. Fishing can be excellent, especially in the evening hours when bass are actively feeding on baitfish. Along shorelines, near islands and the northern section of the lake into the river channel are all proven bass hotspots. Belwood Lake is a great year round getaway, cast a line and give it a try. For more information visit the Grand River Fishing Forum. Each detailed map provides depth, contours, structure, boat ramps, and updated fishing information. Belwood Lake fishing maps also include lake info such as gamefish abundance, forage base, water clarity, weedline depth, bottom composition, complete latitude/longitude grid lines and dozens of GPS waypoints & coordinates.